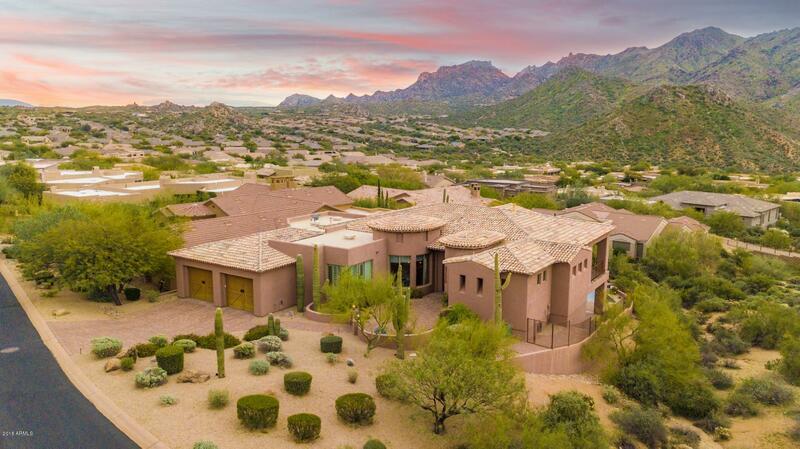 All TROON VILLAGE homes currently listed for sale in Scottsdale as of 04/18/2019 are shown below. You can change the search criteria at any time by pressing the 'Change Search' button below. 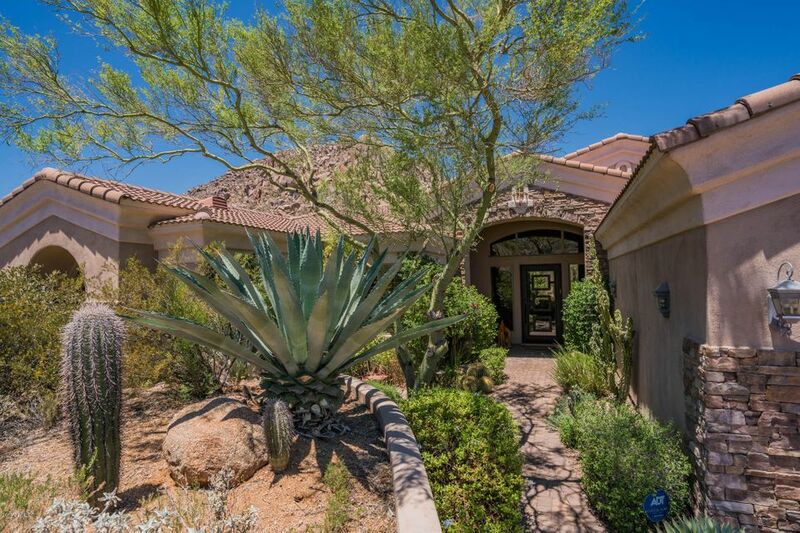 "VOTED BEST HOME ON PRIVATE ESTATE TOUR Absolutely Stunning Mountain View Home nestled in Troon Mountain Estates. Guard gated golf course community. Custom Quality built home with 2nd level constructed w/steel beams and concrete. Cul-de-sac home borders large NAOS area. Enchanting courtyard entrance with stone water feature welcomes you into the dramatic living areas, featuring soaring ceilings, pristine hickory wood flooring and picture-perfect panoramic mountain views. Great Room features wall "
"Home is now vacant with a new price reduction. Sellers motivated to sell this fantastic home on Cul De Sac in Windy Walk. Impeccably maintained, owners have updated, including Heated Pool (2015) and Spa, New, gorgeous garage doors (2017),Glass and Wrought Iron front door added in 2017. Wolf ovens, subzero refrigerator, warming drawer and microwave added in 2017. Powder room fully remodeled in 2016. Beautiful resort backyard, landscape lighting all LED. Absolutely gorgeous home!" 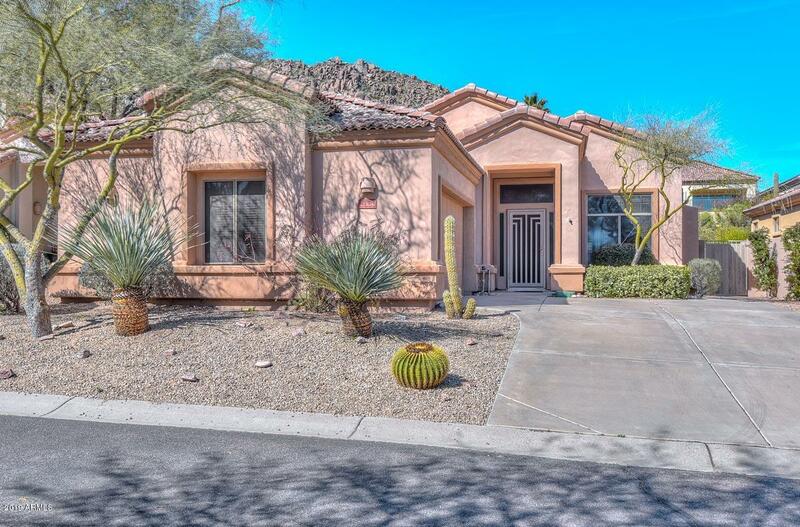 "Fabulous home in highly desired Troon Village*Enjoy beautiful mountain views*cozy 2 way fireplace in kitchen + family rm*Great kitchen, tons of cabinets, granite countertops & pantry*2bedrms, 2 1/2 baths plus a den/office/playroom*Tile in entry & hallways plus newer carpet*Spacious living rm with built in book shelves*Very open floor plan*Restfull master & spacious bathrm, divided double sinks & roomy closet, separate tub+shower*Relax in the great backyrd, mountain views, flagstone patio, spa"